I had broccoli salad for the first time about eight or nine years ago when I went to a family gathering with my wife. It was surprisingly good. 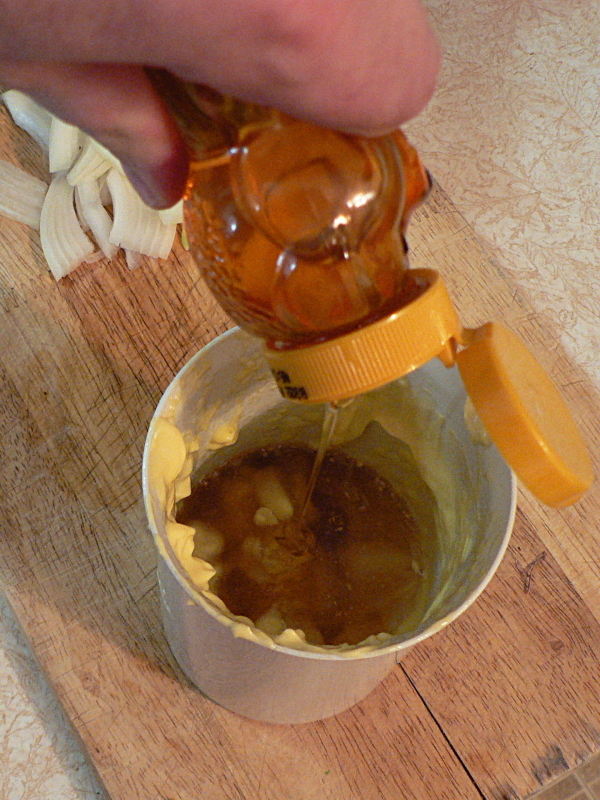 Unfortunately, everyone I asked for a recipe told me what kind of bottled salad dressing they use. I guess they don’t understand the whole “from scratch” thing for what I put on the blog. So after an hour or so of research I finally found a good one that I could do. And it included a fantastic tip that makes this the best version I’ve had. Cut the bacon into bite-size pieces while it’s still frozen. It cuts much easier that way. Cook over medium heat until it’s browned but not crunchy, then scoop everything out to a bowl or plate lined with a paper-towel to soak up the grease. Here’s the great tip. 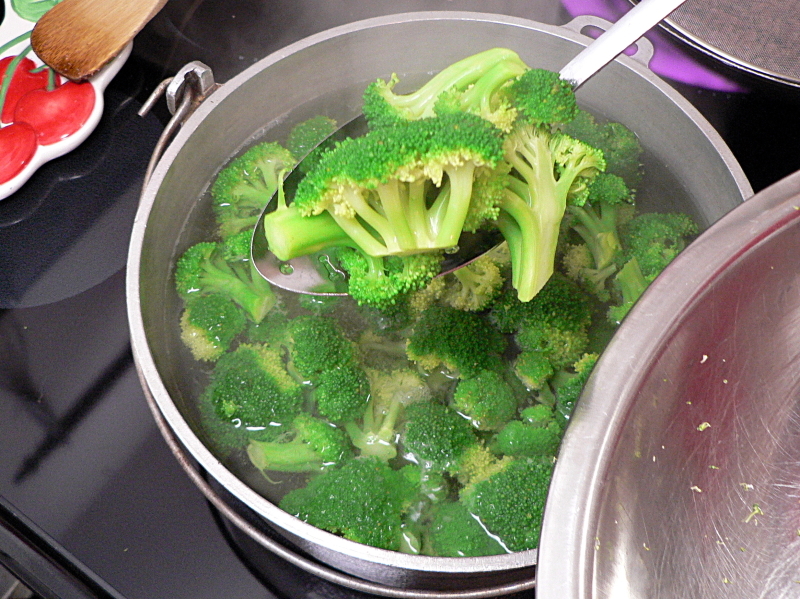 If you blanch the broccoli it will turn a brilliant emerald green, and be just a little softer. Cut the florets off and into bite-size pieces. Place in boiling water for only one or two minutes. As soon as you see the color deepen, it’s done. 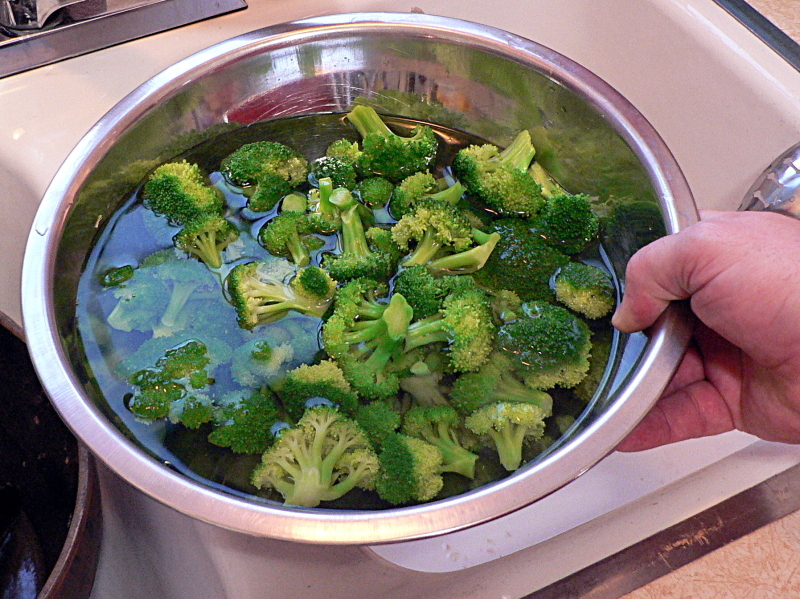 Remove the finished broccoli to a bowl of cold water to stop the cooking process. Drain the water and replace with cold water again once or twice, until the broccoli is well cooled. Then drain in a colander. 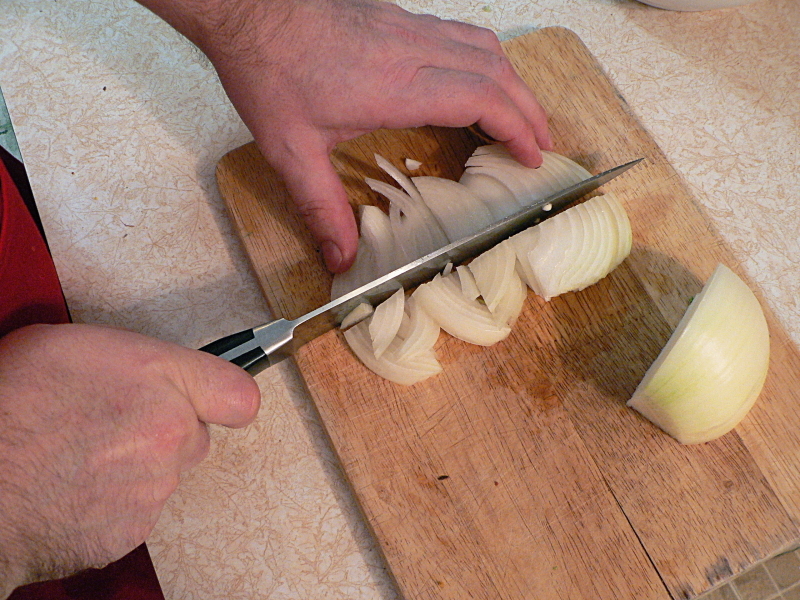 Cut the onion into shreds. 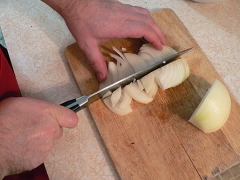 Red onion will look nicer, but I forgot to get some so I used sweet onion. Tasted just as good. The dressing calls for one cup of mayo. 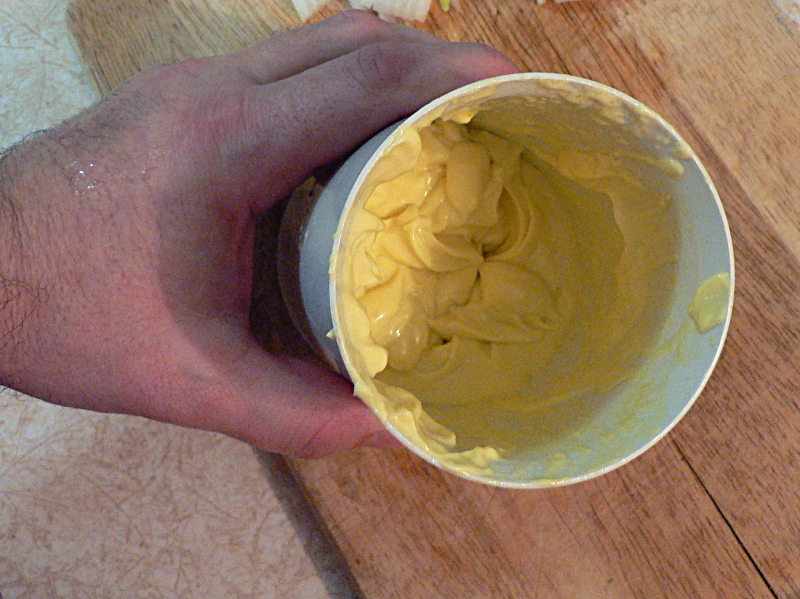 I’ve stopped buying it and always make my own mayonnaise now. Of course you can use prepared mayo if you’re not as crazy as I am. Add the cider vinegar and the honey and stir. 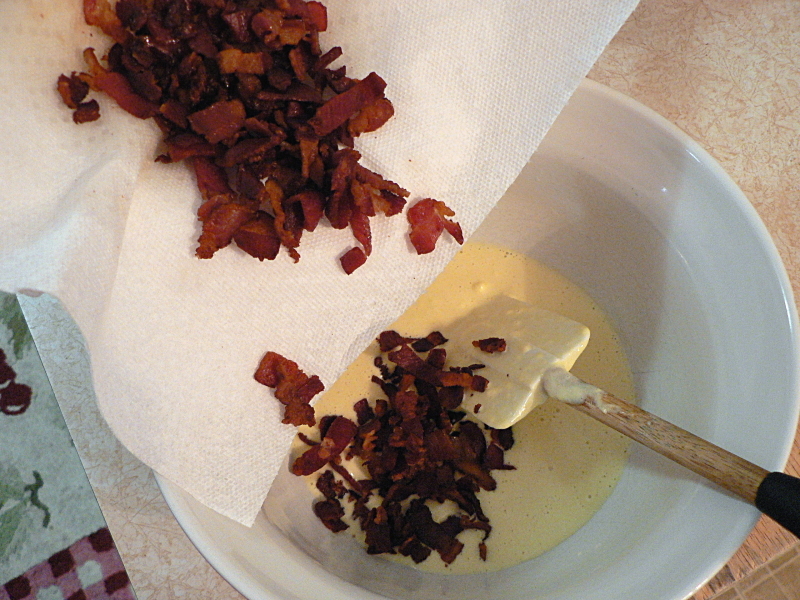 Then add the bacon and onion to the dressing and stir together. 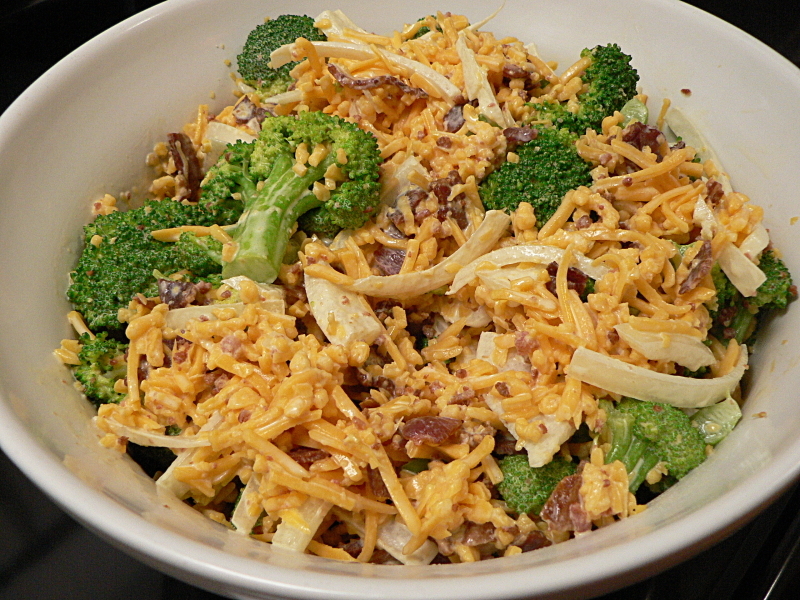 Add the cheese and broccoli and … hey, where did the pictures go? I was sure I took some? Hmm … it looks like I had too many things going at once and forgot to take those two shots. Imagine that in this space you see me adding the drained broccoli and about two cups of cheddar cheese and gently tossing with a wooden spoon. 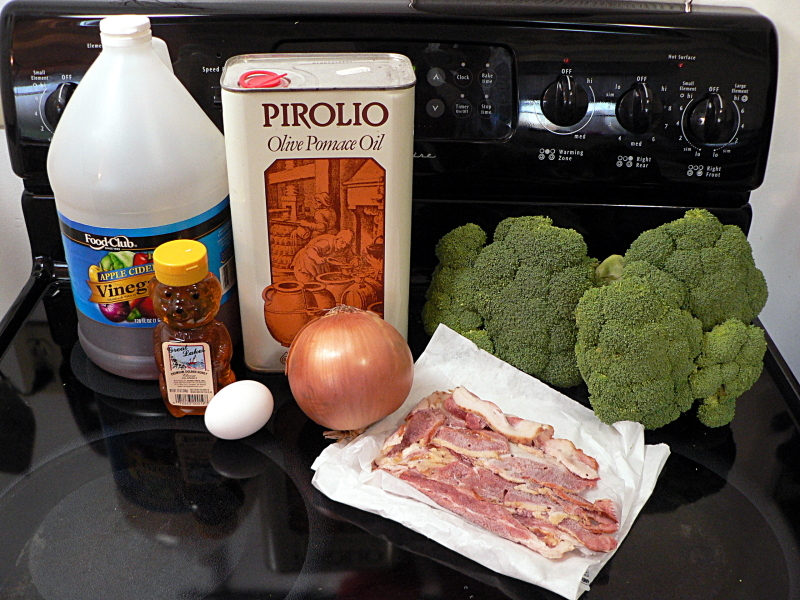 You don’t want to mash the broccoli, that’s why you mix everything else into the dressing first. Oh, and also imagine that you see me transferring to a larger bowl halfway through the process because I didn’t have enough room to mix it. 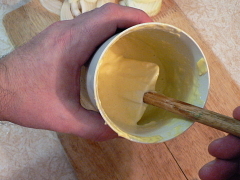 Rule of thumb: when mixing, always use a bowl at least 50% larger than what will hold all the ingredients. 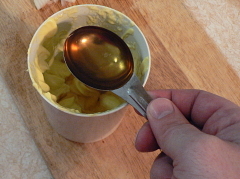 Transfer to the right size serving bowl. This is part two of a “picnic in January” we did. Part one was the twice baked potatoes. I’ll have the main course tomorrow, and it’s a good one. 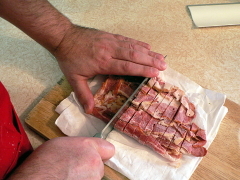 Cut the bacon into bite-size pieces while it's still cold -- nearly frozen is easiest. It cuts much easier that way. 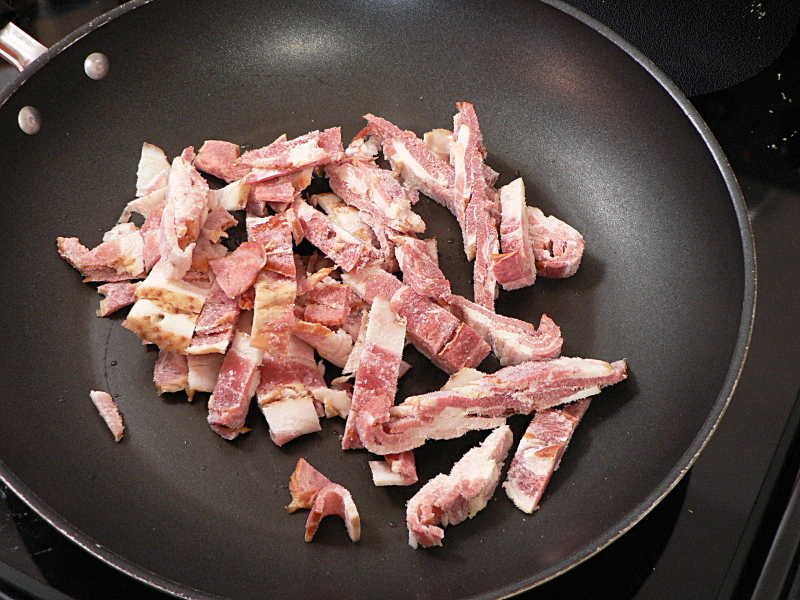 Fry it until browned but not crunchy. 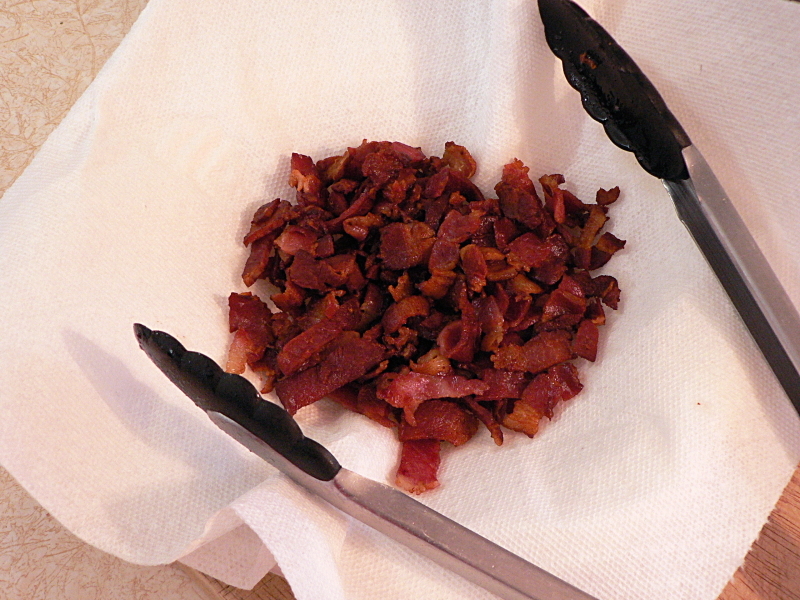 Remove to a plate covered with paper towels to drain and cool. Cut the heads off the broccoli and divide them into bite-sized pieces. Blanch by putting in boiling water for about a minute or two. Work in small batches so the water stays at a boil. 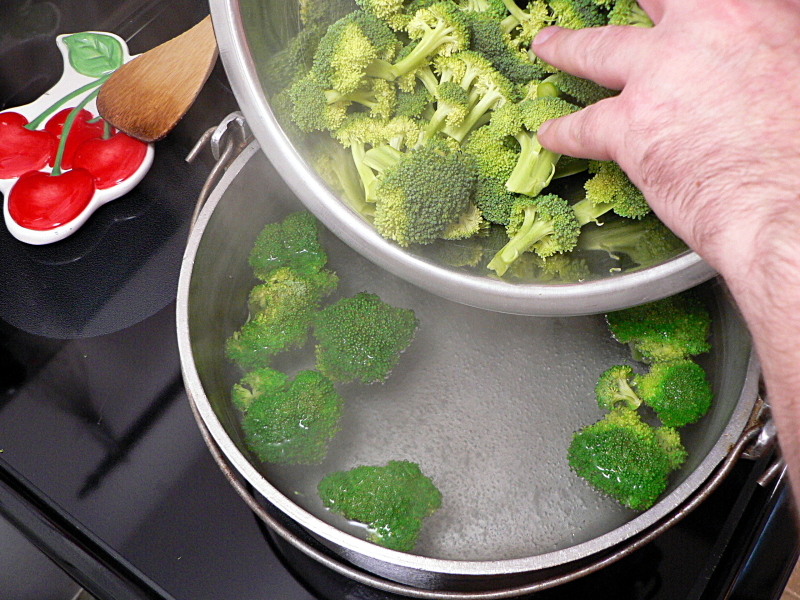 As soon as the colors changes to deep green, remove them to a bowl of ice water to cool and stop the cooking process. While the bacon cools and the broccoli dries, mix the dressing in a large bowl. 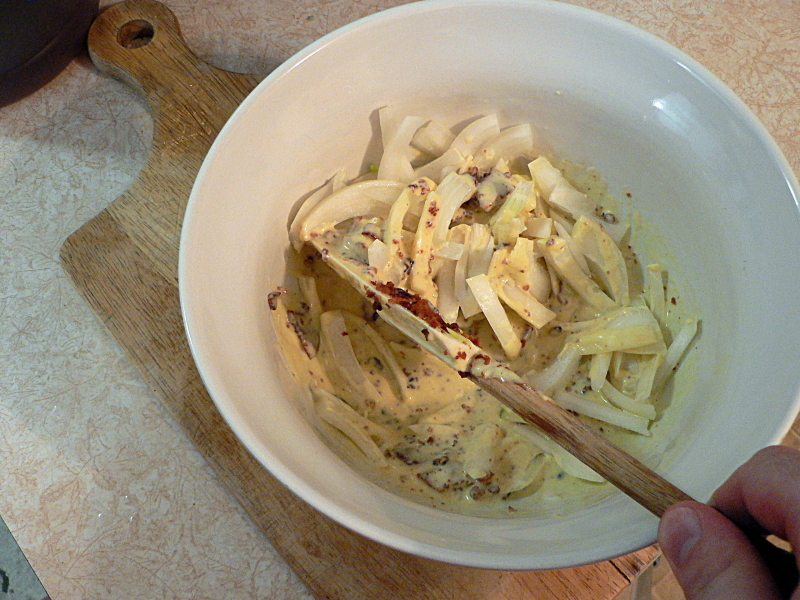 Slice the onion into shreds and stir the onion, bacon and cheese into the dressing. 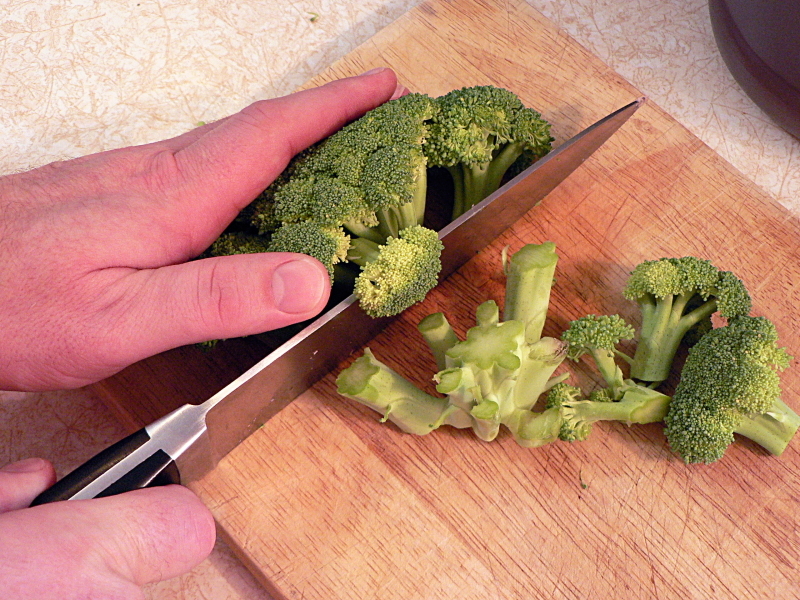 Finally, add the broccoli and toss gently so you don't crush the florets. Refrigerate until ready to eat.